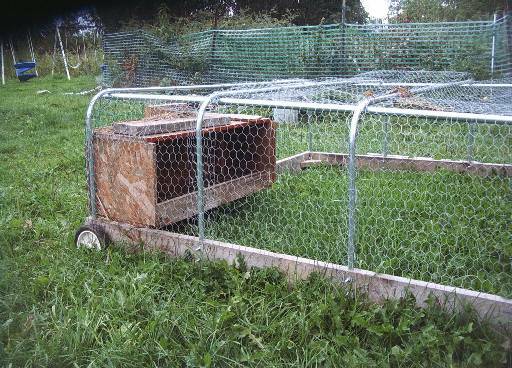 Here is a basic plan for a chicken tractor that is lightweight and roomy. I used 2x6 lumber 6' long for the bottom frame. Cut some extra pieces with 45 degree ends for corner braces. Drill 3/4" holes about 2 inches from the ends and then split the remaining distance into thirds. Bend 1/2" thinwall conduit for a 2' sidewall height leaving about 6' for a span. And then bend 3/4" conduit (2 sticks) for the handle. Clamp the handle in place use a 3/4" conduit connector to hold the ends together. Drill holes and bolt the handle to the 1/2" conduit using 1/4" bolts. 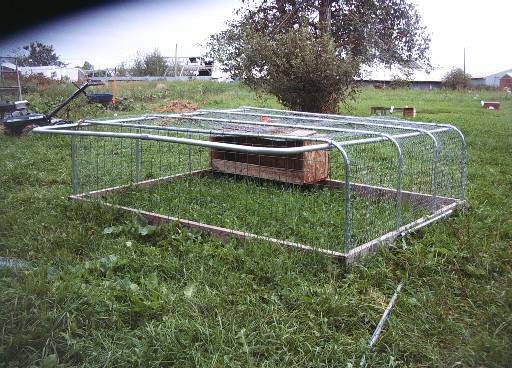 Cover the tractor with 2' chicken wire using wire to hold the chicken wire to the conduit. Leave a side wall unfastened for access. To close the access I rolled up the end of the chicken wire on a small pipe and nailed small bungee cords to the frame to hold it in place. A nest box can be constructed and nailed to the frame. These will also work well for bunnies if the handle is attatched directly to the 2x6s in front and you staple something like 2"x3" fencing on the bottom. The handle needs to be attatched better or it will bend and possibly break the conduit with the weight of the bunnies.